The last few weeks have been rather difficult on Spring - she's been sick a lot and feeling quite awful. She has some medication that alleviates the discomfort. It has, however, come to our attention due to the input from several doctors, that she appears to be afflicted with nausea caused by a medical condition called pregnancy. That's RIGHT! We're having a BABY!!! We are over the moon with this, excited, scared, curious, anxious, tickled, and more. All I know is that I am gonna teach this little person all about canoeing and camping and bushcraft and flora and the forests. 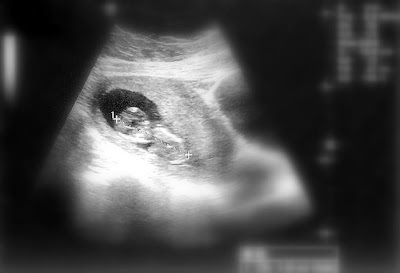 Image artifacts were superimposed over the foetus to determine the length, but ignoring these, you can see tiny little foetus' head at the top left, sort of facing towards the 'camera' (2 ghostly dark eyes), and what might be the arm or the torso extending down. It appears to be resting its head on a little soft wool blanket. In another 6 weeks, the various bits and pieces will begin to appear and we will then know if it is a 'he' or a 'she'. Meanwhile, here is a 3-D representation of a 12-week old foetus doing what foetus's do (which apparently is mostly swirling around a lot).